How much do you think you know about Christmas? Here is a simple quiz to see. ㆍ What memorable event happens on Christmas? ㆍ Why is it called Christmas? And why is it often called X-mas? ㆍ Do all Christians celebrate the December 25? ㆍ Why is the day before Christmas also celebrated? ㆍ How do people around the world celebrate Christmas? ㆍ Is Christmas a universal holiday? Did you answer all the questions? Let us check! Despite a common misconception, Christmas is not the actual day on which Jesus of Nazareth was born. The exact birthday of Jesus has never been discovered, even though many theologians and historians have made suggestions. According to one widely known hypothesis, Christmas was fixed on December 25 in order to Christianize and absorb a Roman festival that had occurred on that day. This festival celebrated the birthday of Sol Invictus (“Unconquered Sun”), the official Sun God of the latter Roman Empire. The Romans celebrated it on that day because it was the winter solstice, which is when the days begin to become longer, symbolizing the prevalence of light and the resurrection of life. The word Christmas is a shortened form of “Christ’s Mass,” deriving the Catholic tradition of celebrating the day through Mass. The more shortened version, X-mas, has the same meaning. It is based on the letter X (chi) in Greek, which is the initial letter of Χριστ?? (khristos, “Christ”). Because Catholic liturgical days, inherited from Jewish tradition, start in the evening, the celebration of Christmas has long begun on the night of the December 24. 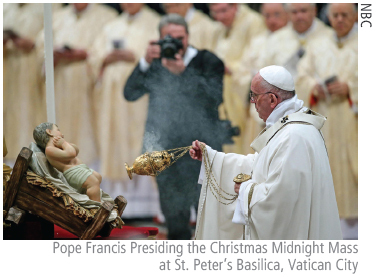 Though more Masses were added later, the one on Christmas Eve is still remains. Most Christian denominations celebrate Christmas, while a few never do so because of religious reasons. Interestingly, however, the exact date to celebrate actually differs by religious sect. Eastern Orthodox churches in countries such as Russia celebrate Christmas on January 7, which corresponds to December 25 on their Julian calendar. How do people spend Christmas? Even though Christmas traditions vary from one country to another, there are some common features that are found in many different regions: mythical stories of Santa Claus, music and carols, exchanging cards and gift giving. 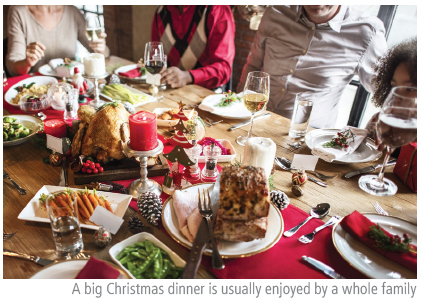 Some traditions, such as special holiday cuisine, may differ across different areas. South Korea has a somewhat special tradition in terms of behavioral patterns, where many people spend time with their significant others. Conversely, it is common for people in Western countries to be with their families instead. The particular reason for this difference is in part due to historical experiences, where the Korean government had declared martial law and imposed nighttime curfews. Since Christmas was an exception to the curfew, the day was a rare chance for couples to stay with each other. Contrast this with how the holiday is celebrated in the West, where it is more general for people to spend Christmas with family. For example, in the United Kingdom, Christmas is so important to families that even most public transportation stops running. In the United States, the holiday extends to New Year’s Eve, making up a week to ten days of celebrations at the end of the year. Businesses are also in great demand during the holiday season, and the prices of various products are lowered during the holiday period. In countries in Oceania such as Australia or New Zealand, Christmas is in summer when people start to enjoy their vacation. One interesting feature of Christmas that varies by region is food. Different countries serve unique cuisines during the Christmas season, ranging from sweet desserts to rich dinners. 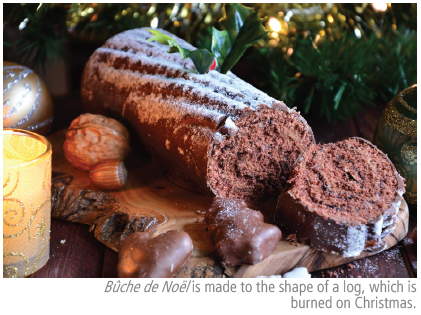 In Belgium, France and several former French colonies such as Quebec, a cake called buche de Noel (“Yule log”) is served on Christmas. It is a sponge cake made to the shape of a miniature Yule log, which was burned on a hearth on Christmas in European culture. This tradition has several origins, including one that says Celts burned a special log on the winter solstice in order to expel bad luck and evil spirits. In Germany, people eat fruit bread called Stollen during the Christmas season, in which the bread is often called Weinachtsstollen (Christmas Eve’s Stollen) or Christstollen (Christ’s Stollen). Stollen is basically fruit bread made of dough and occasionally flavored with white wine, and the bread is topped with sugar or icing, depicting baby Jesus in swaddling clothes. In Italy, because it is common for people to attend a midnight Mass on Christmas Eve and follow the custom not to eat any meat, they serve various fish and seafood instead. This meal is called La Vigilia (“The Vigil”), or the Feast of the Seven Fish, and consists of seven or more kinds of fish. On the other hand, in the United Kingdom and other countries influenced by it, a common Christmas dinner includes turkey or another large bird, along with potatoes and vegetables. Likewise, Brazilians and Peruvians enjoy a large dinner of roast turkey with their families and relatives. In spite of its popularity over the world, not in all countries in the world is Christmas a national holiday. Some countries where Buddhism or Islam prevails do not recognize Christmas as a national holiday. While in these countries people simply choose not to celebrate Christmas, there are other countries where people are actually prohibited from celebrating Christmas by the government for religious reasons. In 2015, the British newspaper Metro identified various countries that have banned Christmas, including Saudi Arabia, North Korea, Albania, and even China. According to Business Insider, in 2012, 41 people were arrested in Saudi Arabia for “plotting to celebrate Christmas.” These countries still do not allow their people to celebrate “pagan” holidays because of the religious meaning within them, even though these countries are diminishing.